If we say that we have not sinned, we make Him a liar, and His word is not in us (1 John 1:10). 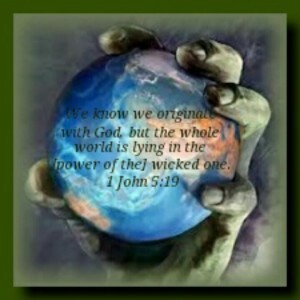 We know that we are of God, and the whole world lies under the sway of the wicked one (1 John 5:19). The first two texts, 1 John 1:8, 10 do not require much explanation. It is obvious that John is not teaching any sort of doctrine of Total Depravity, but is simply saying that everybody sins, and that if anybody claims to be without sin, they are sinning by making such a claim. No non-Calvinist disagrees with this. Almost all Christians of all types believe that everybody sins. It is a straw-man fallacy and non-sequitur to say that if a person denies the Calvinistic idea of Total Depravity then they don’t believe that all people are sinners. You can deny Total Depravity and still accept the biblical teaching about the universal sinfulness of humanity. The third passage quoted above, 1 John 5:19, is sometimes quoted in reference to total inability. Like 1 Corinthians 2:14 and 2 Corinthians 4:3-4, 1 John 5:19 is used to say that people are under the control of the devil, and therefore, cannot see or understand the truth of the gospel, nor respond to it, for the devil, who controls them, will not allow it. The first thing to note about 1 John 5:19 is that the words “control” or “sway” are not found in the Greek at all. These words are added by the translators in an attempt to make sense of what John writes. The addition of these words is due in large part to a second translation issue in this verse. So in 1 John 5:19, translators have to decide whether the substantive adjective (Gk., tō ponērō) is referring a thing (wickedness) or to a being (the wicked one). Those translators that opt for “a being” called “the wicked one” then add additional words to the verse to show how the world lies on the wicked one. They say it lies under “the power” or under “the sway” of the wicked one (NIV, NAS, NKJV). Those translations that opt for a thing, “wickedness,” need no additional words to explain John’s point (KJV, Rheims). I am generally uncomfortable in adding words to the biblical text to smooth over translations, and so prefer what is found in the KJV on this text. 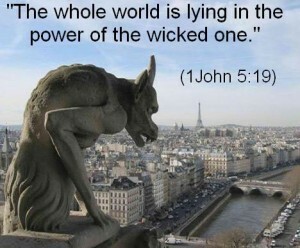 John is saying the world lies in wickedness. It is covered in wickedness. This point would be identical to what John wrote earlier in his letter, that everyone is a sinner (1 John 1:8-10). Even if, however, we accept what is found in the majority of other modern translations, and John is understood to be saying that the world lies under the power, control, or sway of the wicked one, this verse still does not teach total inability for at least two reasons. First, since the words “power,” “control,” or “sway” are not found in the text, the translator is free to add whatever words he wants to help the reader understand what John is saying. Usually the translator will try to add words that fit best with the overall context of the passage and book, but more often than not, the translator will add words that also fits with their own preconceived theology. This is why the NIV, which is heavily influence by Calvinistic scholars, chose the word “control.” This is the strongest of the possible words that could have been used here, as it implies that Satan is in complete control of this world and therefore, unregenerate unbelievers have no ability to understand, respond, or believe the truth of the gospel of Jesus Christ. The NKJV, however, uses the much more ambiguous word “sway.” This does not imply complete control, but instead is closer to the idea of “influence” or “guidance.” Obviously, I prefer this sort of idea, for it better matches my theology. Calvinists may criticize me for choosing a translation of this text which matches my theology, but that is exactly the point. This verse is ambiguous, and all sides of the debate need to understand that we tend to force our theology upon the text to get it to say what we want, rather than allow it to remain ambiguous and move on to other texts which might be more clear. Nevertheless, there is at least one additional reason from the context of 1 John for why the Calvinistic teaching of total inability cannot be found in 1 John 5:19. Even if we say that the verse is properly translated as Calvinistic theology requires, and we allow John to be saying that the “whole world is under the control of the evil one,” this does not mean that the whole world is unable to believe in Jesus for eternal life. Earlier in his letter, John has written about the “whole world” and has stated that Jesus is the propitiation for the sins of the whole world (1 John 2:2). We will look at this verse in more detail when we discuss the Calvinistic idea of Limited Atonement, but for now, it is enough to note that even if the whole world lies under the control of the wicked one, Jesus has done what is necessary to liberate the whole world from the evil one so that they can respond to the gospel and believe in Jesus for eternal life (cf. 1 John 5:7-13). The entire book of 1 John is engaged in this idea about good and evil, light and darkness, truth and error, and John is intent on showing his readers that based on who God is and what Jesus has done for all people, we can choose to live in love, light, and righteousness, rather than abide in hatred, darkness, and evil. That is how to understand John’s final exhortation of his letter. Let me begin by saying I’m not a Calvinist, at least in the traditional sense. I’m not a hyper-Calvinist and don’t really label myself Reformed or any of those labels, but I have studied it a great deal and think I have a pretty firm grasp on the theology. No disrespect, but I don’t think your definition of total depravity is quite accurate. Kris, Where are you getting my definition of Total Depravity from? It is not in this post. By the words you use in your post. Your definition from the post seemed to be, “They seem to say that the world is under the control of Satan.” At one point, you did get close when you wrote, ” unregenerate unbelievers have no ability to understand, respond, or believe the truth of the gospel of Jesus Christ,” but you incorrectly linked this with Satan being in control of the world. As my link points out, it’s not because Satan is in control of the world that we are totally depraved and unable to get to God on our own. It’s because of our own sins. Since you’re saying that’s not your definition of total depravity, what is yours? 1Jn 5:19 does not say about Satan or Devil. It’s simply ‘the evil’ – the world under sway of the power of evil. I’m not sure why people got stuck with Satan/Devil. Perhaps they love it as a person, not different from people of pagan religions. I think it’s so they have “someone” else to blame, and avoid personal responsibility. Yes, I made this exact point in the post, that the text may not be referring to “satan” at all. The greatest coup of the devil, is that people believe that he does not exist. On our own, we are no match for the devil. The help God give all people is the truth….the Word of God…hence we are all ‘able’ to choose whether to accept or reject the truth (the Word/Jesus Christ). Calvinism lies in the power of the wicked one. For a very long time of concerted thought, it was my belief that ‘evil’ was simply the random egotistical aggregation worldwide of personal weaknesses, mostly to do with fear, pain, greed or just for some an innate bastardry. But, increasingly i can see a full spectrum of clearly intentional conjuring to steer our individual search for truth away from what i’m sensing is real. I used to scoff at the idea of a single entity that was in the evil business, thinking those people weak of mind as to need one bogeyman to distract from their own weaknesses. But as mentioned i’m increasingly seeing a widespread convergence of lies, deceit and false doctrine (both rational and empirical) across politics, media and entertainment, economic and even academic. It is so widespread and so similar in its message that i have come to the only recent conclusion that it must be intentional and it must be coordinated. Whether there is a single entity, a wicked one, directing is of secondary importance to knowing the attributes to this most open and extensive ring of liars. The very nature of every aspect of most peoples lives entails distraction and the lie of personal freedom. 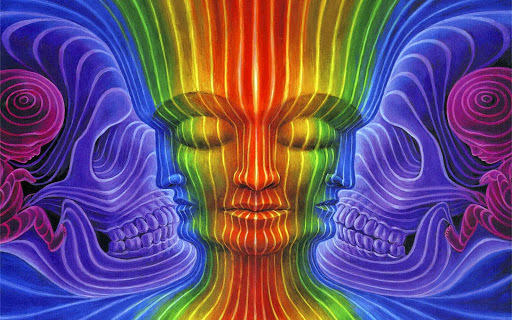 Entrenching the ego and giving us all the sense that we are all powerful entities who can completely self determine. That idea is promulgated by religion, science, politics, popular culture to the point that this ‘idea’ seems so a priori as to not need examination. Something much larger and much more ingrained into the very ontological fabric of even insightful Christians is afoot. It is SO well conceived, so well constructed and so well executed that it cannot possibly be of normal human intent. Yes, the big question for everyone is whether they believe in the spiritual reality of evil. As a Christian who believes that is the case I feel I am in the minority. However, most secular folks have no problem with it. How many times do your read about people dealing with their demons or having to fight their demons. I just finished a book on a new form of psychological therapy that has at least four chapters with demons in a chapter title. If it walks like a duck…. So when Jesus kicked Satan and his demons out of heaven (Rev.12) he kicked out a…mood, an emotion..? Most certainly you all ly(lie) in wait to “deceive the hearts of the simple”! For those of this evil world and/or religion’s way crucified The Messiah! No more needs be said!